The Icehotel (styled as ICEHOTEL) in the village of Jukkasjärvi, about 17 kilometres (11 mi) from Kiruna, in northern Sweden, was the world's first ice hotel. After its first opening in 1990, the hotel has been erected each year from December to April. The hotel, including the chairs and beds, is constructed from snow and ice blocks taken from the nearby Torne River. The structure remains below freezing, around 23 °F (−5 °C). Icehotel AB searched for business partners during the early and mid-1990s, and the founder, Yngve Bergqvist, decided upon Absolut Vodka as the first sponsor. The first Absolut Icebar opened in Icehotel in 1994, and today the concept is used in three cities: London, Stockholm and Jukkasjärvi. 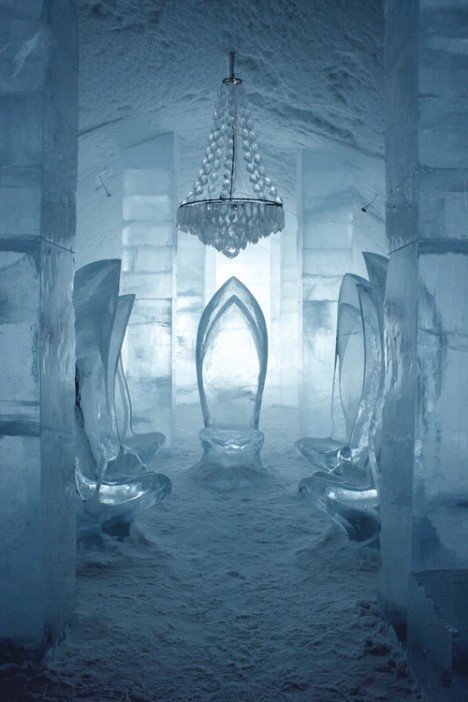 Several high-profile events around the Icehotel have since been initiated by Absolut Vodka. In 1994, the extension was an advertising shoot for Absolut Vodka to Jukkasjärvi, with photographer Herb Ritts. Models Kate Moss, Naomi Campbell, Mark Findlay and Marcus Schenkenberg were photographed surrounded by ice, wearing creations designed by fashion designer Gianni Versace.